This is a sketch-recording pen that records handwritten notes and sketches in the pen's internal memory. This allows writers, artists, inventors and architects to make sketches on restaurant napkins, and transfer the information to the computer. 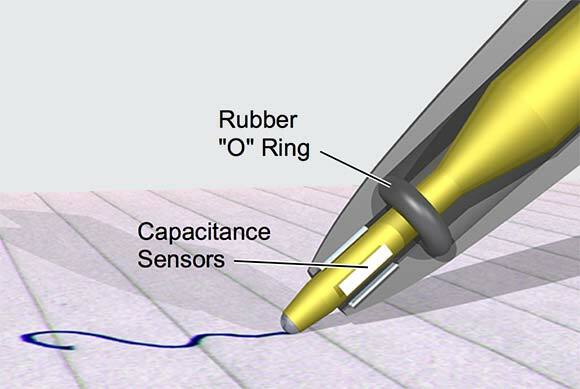 The pen senses pressure on the tip using piezoelectric strain gauges or by measuring capacitance of the air gap between the ink cartridge and the barrel. A metal ballpoint ink cartridge, is nominally centered in the barrel with an O-ring near the tip. Four metal sensing strips are arranged around the inside of the pen barrel and are air spaced from the tip and wired to the pen's circuitry. When the pen is pressed on the paper, the tip flexes and alters the air gap between the cartridge and the metal strips in the barrel, therefore altering the capacitance. The varying capacitance in the four strips is converted into X-Y data and stored in the pen's RAM. The pocket clip keeps the pen from being rotated, keeping the top capacitor strip up. The recording pen offers the ability of taking notes and recording sketches. As a result, signatures can be recorded to provide automated check signing. This is not a product for sale, but is shown as an example of technology, developed by Steve Hines, which clients can expect from HinesLab on a consulting basis.